I kept my hands busy by using my trusty seam ripper to remove the broken zipper from my younger son’s backpack. Although I am a laughably amateur seamstress, the work of removing stitches is well within my skill set. (Luckily, my friend Lise will hold my hand through the installation of the new zipper.) 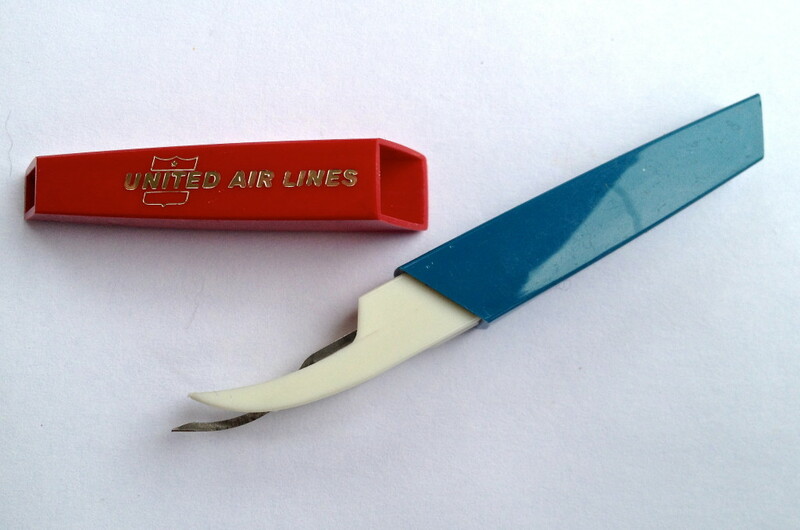 As an aside, don’t you just love my vintage United Air Lines seam ripper?! I have absolutely no idea how this item added itself my sewing basket, but I do feel deep nostalgia for a time when airlines would have kept potentially lethal items on board for passenger use. Sadly, that age of innocence has passed. Last night’s dinner featured delicious and on sale chicken basil sausages from New Seasons Market. However, money is currently tight at my house, so I walked to Fred Meyer for the rest of my shopping list. They were out of the sale Tillamook cheese, ($3.99 for a 2-pound loaf) so I got a rain check for when it’s in stock again. The rest of the meal featured a big green salad and sauerkraut whose origins hark back to a soccer league picnic from at least a year ago. I picked up library copies of Cheap: The High Cost of Discount Culture, Farewell my Subaru: An Epic Adventure in Local living and the new Kinsey Milhone Mystery. Because even I need a break from Non-Consumer obsessiveness! I hung a hook by the front door for my sons to hang their school ID cards. Since these cards also function as their public transportation passes, it’s imperative that they bring them to school every day. Hopefully this little life hack will cut down on all the “Mom, I forgot my bus pass, will you come pick me up?” phone calls. It’s been a week, and so far so good! Now your turn. What frugal activities have been filling your days? Besides working 60 hrs this past week, I’ve been doing a decent job of staying together. I hope I don’t burn out from all this work in Mid November because it will last until January. Love paying off my bills and stashing some cash in the bank for a rainy day. Ate some leftover spaghetti instead of ordering pizza. Took leftover chicken chili and spread some into tortilla shells with cheese and made some quesadillas for dinner. Used some frozen pumpkin and chopped apples to make some apple pumpkin muffins for hubby’s lunch. Looking up new recipes to cook. Even though it’s the first official day of autumn and it’s cool in the New England area, my laundry hanging will move inside unless the temp will be over 70. And that’s not expected until the end of the week. Apple pumpkin muffins? Lucky husband! Son #2 is following my lead and trying to avoid wheat. I’m supporting his efforts by grilling up a bunch of chicken, then freezing it, so he can have a healthy meal at school, or at home instead of his usual pizza. Drinking iced chai made using spices from the Indian grocery. Pulling out my fall decorations from their bin in the basement, all purchased years ago from thrift stores. They look great, because I take good care of them and rotate them out as the seasons change. Dishwasher running using homemade detergent. The dishes and glassware are all thrifted. Lunch was a lot of leftover vegetables. I’ve lost so much weight this summer that my thrifted summer wardrobe will need to go back whence it came, and I’ll be in the market for a smaller size. Can you share the recipe for dishwasher detergent? That thing is actually a coupon cutter. I think that it predates coupon cutters. I can remember my dad, an avid couponer, using one of those in the seventies. I did a little digging, and I think you may be right. Works as a great seam ripper though! Last night we had an awesome late birthday celebration with our fair recent new friends in the neighbourhood. It was a potluck and so much fun. I made an awesome brownie which my gf and her husband loved it but I felt could have been even better. We traded our frugal tips on where good but cheap eats could be found and I will be buying some cheep steaks and chicken breasts when the next pay cheque comes around. Yes things are tight around here as usual but I was was supper stoked to buy 3 bras that looked brand new from the Value Village for under the price of one new one at the local Target. Big score for me. I won a $50 dollar gift card from our local butcher last wee and that is a real boon to our grocery budget and I then found a %10 off coupon for them too. My husband also came home with a bunch of free deer pepperoni sticks on of his guys gave him from work. Also a bonus is all the tomatoes my neighbour is letting me harvest from her garden. I’m going to freeze a whole bunch today. Things are good this time of year in the Okanagan because there is some much fresh veg and fruit available at the cheapest prices of the year. Also cleaning the silver using the sink of hot water, aluminum foil, and baking soda method. My candlesticks and bowls are shiny and ready to look pretty for fall. I bought three pair of jeans and a maternity shirt at the Goodwill for $19, including the use of a 20% off coupon for donating. I tailored the shirt and one pair of the jeans to fit me pefectly for the next couple months. I sold a piece of furniture that i no longer needed on Craigslist for $40 and then bought a piece we do need for $40. Taking advantage of the cooler weather to turn off the AC. Can’t wait for a cheaper electric bill next month. I’ve been prepping to go back to grad school and taking advantage of inter library loan and library database access to get scholarly materials instead of buying them. It’s the real start of gardening season here in SW FL but I harvested lots of greens for salad; started tomatoes & peppers from seed; as a trial for my hubby, we are only buying what we absolutely need including at the grocery and have saved over $100 so far just on groceries; collected newspapers from the neighbors to use as the first layer of mulch around the citrus trees and then topped that with mown grass – of which we have tons as it’s rainy season and has been raining a lot; rehemmed 2 pair of pants for hubby so he doesn’t need to buy new ones; frogged a shawl I didn’t like and am now knitting a wrap that I do like. Basically my life is filled with frugal activities – almost always has been and will be. Our life style suits us – we are happy and content. Farewell my Subaru is a fun story. I enjoyed his adventure as he moved to a more sustainable life. I also learned from him just how much of a challenge goats can be. I just found a local CSA type connection for locally grown fruits and vegetables. Our first box comes on Thursday — can’t wait! And after visiting the local pool 2x, I’ve decided to go with a sarong cover-up, so I’ll be heading to the thrift store this week to see if I can find a sheet to convert before looking at the fabric store for new fabric. My father also had that coupon cutter! Funny, I borrowed a seam ripper from my daughter over the summer to redo a blouse and it’s still sitting on my dresser. Now it’s fall and won’t need the blouse until next summer Mmmm! Canned 10 1/2 pints of Bosenberry jam, and 8 1/2 pints of raspberry jam today. Husband got the generator tuned up and ready to go, so I guess we’re ready for winter. Make me sad!! We’ll try this again. My mouse fell and I lost my post! I read Cheap. Good read. I went to my favorite department store to shop on the 70% sale rack. In the men’s department, I found two long sleeved shirts for next spring that I will use for blouses. Of course I had a coupon! I find that men’s shirts fit better and seem to be better quality. I needed a new quilt for my upstairs bedroom and found it at a garage sale for $1.00! All I need to do is fix the raveling on the outside edges and it will be gorgeous. PS. This will frost your buttons: it was handmade. Put up tomatoes until I couldn’t stand it any more. That’s about it. But like Katy, I love watching every frugal thing I can do. It is fun to have money in the bank and food in the larder and a pleasant home. Not sure what “frost your buttons” means, but $1 handmade quilts make me frost each and every button! Dang, that’s the deal of the century! It means that it will make you jealous. There was another quilt there but too stained to do much with. I offered her fifty cents, but she held out for the dollar! I forgot, My 91 cent chicken from Fred Meyers fed us for 2 nights then roasted the carcass for chicken vegetable soup. We ate that for 3 nights, then I took the carcass and boiled it in water for the dogs. They got 2 qts of liquid for topping on their dry food. We ate the 91Â¢ chicken with mashed potatoes, peas and gravy the first night, and have been eating chicken soup for two separate nights. Although tonight I made dumplings to make the soup a bit more filling and exciting. One time my mother-in-law apologized to my husband when she and I returned from shopping together by telling him she didn’t make me spend the money. My husband though just laughed and told her how I worked and had my own money and he didn’t care what I spent. She was a homemaker and had to account for every penny. You should have seen the look on her face when her son told her it was none of his business what I spent. Just like the guy who said that to you, basically that you should go out and punish your hubby by spending all his money. Hard to believe it’s 2013 sometimes. I talked myself out of going to stores and instead went for a morning and afternoon trail walk as well as a nice cool swim…all free! And finished knitting a hat with donated yarn while sitting on my porch on the first day of fall and it actually felt like fall in Austin. nice list! must say that coupon cutter is awesome! I had a particularly cheap-date-night on Saturday. After reading your post mentioning Breaking Bad (and chairs) I decided it was time to take our chances on our hit-and-miss internet connection and join Netflix. So lining up Sons Of Anarchy on Netflix (our freebie trial month), I cracked open a nice bottle of red (a thank you gift from a friend) and knocked up a couple of the new ‘Save With Jamie’ (Oliver) American Pizza Pie’s – approximate cost of 60p per pizza. Frugal Fun at it’s best! forgot to add – the recipe came from a library book! I haven’t watched “Sons of Anarchy” yet, although I’m sure it’s in my future! Started watching it as we like ongoing series so we can get to know the characters. We then discuss the story as it unfolds…we’re so rock’n’roll here! It’s good – I’d say a modern-day-western – motorcycles rather than horses. The SOA lead Charlie Hunnam has been cast as Christian Grey. I spent most of Sunday reading, gardening and knitting. Dinner was a roast chicken dinner with leftovers to be a chicken pie for Tuesday. I spent all of five pounds the whole weekend…as I meet my parents out for lunch and they treated us so I got them some treats from the local bakery. That was Â£5 well spent in my opinion. I love rain checks but half the time I forget to use them or leave them at home. 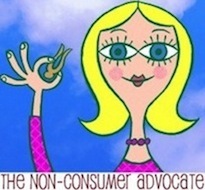 Katy – would love to hear your review of “Cheap: The High Cost of Discount Culture”.